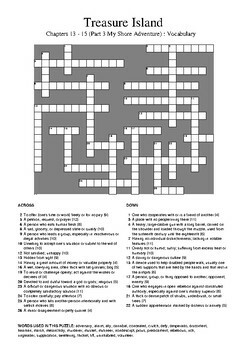 Fun active learning puzzle based on My Shore Adventure (Chapters 13 - 15) of the novel by Robert Louis Stevenson. This is an active learning activity disguised as a fun task. Students enjoy the activity, while at the same time they are focusing on the words - both meaning and spelling. To get a second activity out of this resource, you could ask students to write a new sentence for each word which shows its importance in the novel. 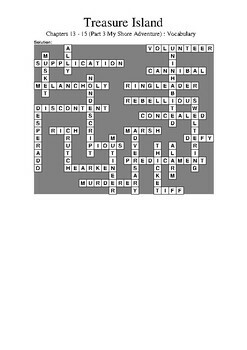 A word bank is supplied to support students. You could redact this to make the puzzle more challenging. The solution is printed on the second page. Download the preview file to see the solution and the grid.